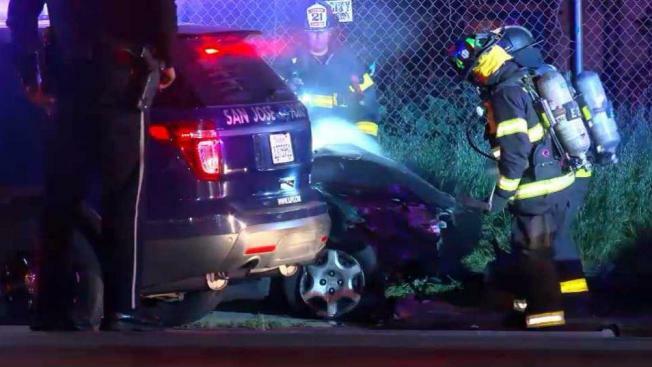 San Jose police said a stolen vehicle crashed into a power pole following a pursuit early Monday, knocking out power for some PG&E customers in the area. Two men in the stolen vehicle failed to pull over around 1:06 a.m. in the area of Allenwood Drive and S. White Road, according to police. The vehicle later plowed into the power pole in the area of S. White Road and Lieb Court. The two men were taken into custody and booked into the Santa Clara County Jail, police said. As of 5:35 a.m., 39 PG&E customers in the area of the crash location were impacted by the outage, according to PG&E. Power is expected to be restored just before 11:30 a.m.